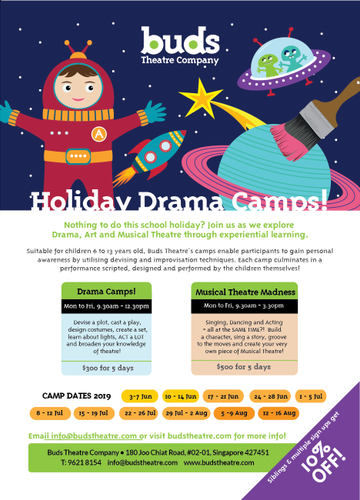 Join Buds Theatre as we explore Drama, Art and Musical Theatre through experiental learning this June holidays! Suitable for children 3 to 13 years old, Buds Theatre's camps enable participants to gain personal awareness by utilizing devising and improvisation techniques. Each camp culminates in a performance scripted, designed and performed by the children themselves. Our camps will be starting from the week of 3–7 June and will run all the way till 12–16 August! Check out our flyer for the dates and be sure to spread the words as we are offering a special 10% discount for sibling and multiple sign-ups! Come and join Buds Theatre for our Drama Camp & Musical Madness! We promise a whole load of creativity and fun for your children!